Northampton, on the Great North Road out of London, was for many centuries, subject to a steady flow of people and goods on the move and thus liable to infections and diseases from this transient population. It succumbed to the plague from 1570 to 1579, then again from 1603 to 1605 when 500 perished. In 1638, the Register Book for St. Sepulchre’s Church has an entry on March 29 among the burials…”att which time the sickness beegan”…and on January 1 of the following year…”att which time the sickness ceased, the Lord be praised.” In this parish in 1638, there were 114 deaths, the average for the previous five years only 18. Understanding what is happening in the area in which your ancestors lived is extremely important. We often overlook the fact that entire families can die when a disease sweeps through the city, town or village. We are searching the records without success and asking ourselves why we can’t find any marriages…perhaps the reasons could include deaths in the family causing families to break apart and move elsewhere to re-establish themselves. 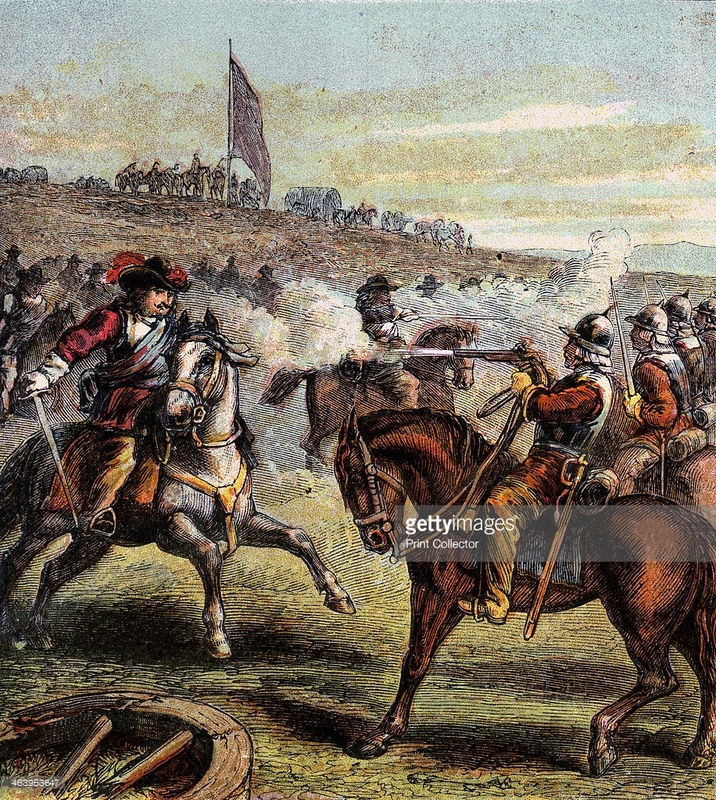 There is also the fact of war..in this case, The English Civil War, a series of armed conflicts and political machinations between the Parliamentarians (Round Heads) and the Royalists (Cavaliers) principally over the manner of government. One of the famous battles took place at Naseby in Northamptonshire. “It was a war that more men per head of population lost their lives than in the First World War, with Northamptonshire always on the front line between the Royalists and Parliamentarians. “On 22 August 1642, King Charles I raised the Royal Standard at Nottingham, signalling the start of the war. He immediately sent around 300 men under the command of Sir John Byron (the poet’s ancestor), from Nottingham to the Royalist center of Oxford to enlist effort in the south. Byron’s route took him through Brackley, where he arrived on the evening of 28th August. Then, as supper was being prepared, they were attacked by a force of some five hundred locals wielding pikes, bills and pitchforks. Whether the attack was opportunistic or planned is unknown, although the numbers are large enough to suggest an ambush. Byron and about half his men made their escape towards Oxford. The others were caught unprepared and routed. The booty was enormous, and the value of all the gold, money and apparel taken was worth more than £6,000 to £8,000. Most but not all was handed over to Parliament. Northampton would become the main infantry garrison and supply depot for the Parliamentarian Army in the East Midlands for the entire war. On 14 September, the Earl of Essex reviewed his army in Northampton. It was said to be 00 – 20,000 strong. The royal connection to Northampton Castle had becomes less significant, and by the time of the English Civil War, Northampton was decidedly pro-Parliament, the people of Northampton supported Parliament and Oliver Cromwell’s Republican Roundhead Army. The town had a long history of religious dissent from the Lollards and Puritanism gained a strong hold on the town. The corporation of the town, having already refused to provide troops to the King in 1632 or to pay the notorious Ship Money Tax in 1636, petitioned Parliament in 1642 against papists and bishops. Over 4,000 pairs of leather shoes and 600 pairs of cavalry jack-boots for the Parliamentary armies were manufactured in Northampton during the Civil War, and a further 2,000 for Cromwell’s New Model Army in 1648. Until well into the 19th century, the shoe industry boomed in and around the town with small manufacturing workshops set up in the surrounding areas. Figures for casualties during this period are unreliable, but some attempt has been made to provide rough estimates. In England, a conservative estimate is that roughly 100,000 people died from war-related disease during the three civil wars. Historical records count 84,830 dead from the wars themselves. Counting in accidents and the two Bishops’ wars, an estimate of 190,000 dead is achieved,out of a total population of about five million. 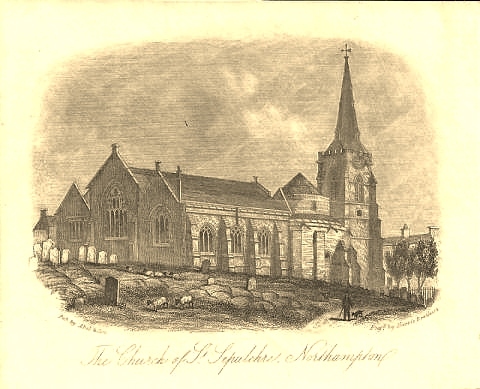 Northampton had only begun to recover following the war when the entire town center was destroyed by fire in 1675. The blaze was caused by sparks from an open fire in St. Mary’s Street near the castle and devastated the town center, destroying about 700 buildings [out of 850] including All Saints Church, in six hours. Three quarters of the town was destroyed, 11 people died and about 700 families were made homeless. Now you may ask what all this has to do with my Family History and my Research. Our ancestors did not live in a bubble. They were part of the action that was going on around them. It is extremely important to know your history and its timelines. It is also important to have maps from that same time period. Villages disappear..borders move. All this information can help you understand why your ancestors did what did and moved where they moved. Nathanel Benfford was likely born around the end of the English Civil War…circa 1654. He married Jane Joalmer in 1679, four years after the great fire destroyed Northampton. They were married at St. Giles on December 20, 1679. The register indicates they were living in Denton, a small village 7 miles outside Northampton. Interestingly, at the same parish church, St Giles, in 1660, a Will Benfford married a Mathe? Taylor on February 11, 1660. It took me awhile to decipher the early English writing, but when I did I had quite the surprise. Here was a possible C. The register indicated that Will Benfford was from Couentree (Coventry, Warwickshire) and Mathe? Taylor was from Northan (Northampton, Nothamptonshire). Hours of hard work had finally paid off….and only if you are a Family Historian will you understand why anyone would spend hours searching for one record. Why would I stop searching at this point when I am on such a roll. WOW…there he was…..an even earlier Bennford…William Bennford… with another spelling of the surname….this time in Raunds, Northamptonshire in 1626 and marrying Mary Wells. Raunds is 20 miles from Northampton. Don’t know where this William is from….more digging. If you believe there to be an error in this transcription then please report it to our data manager. People move….people have always moved….we tend to overlook this fact when trying to locate our ancestors. “single population movement in seventeenth century England was this enormous flow of people into London. 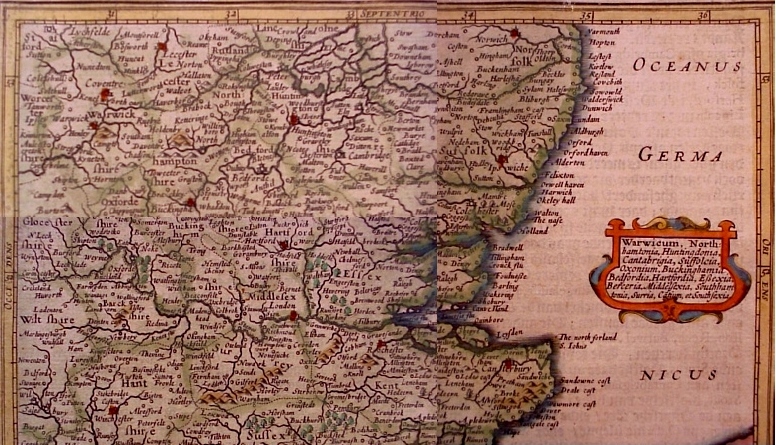 The growth in size of London affected many parts of the country...He mentions Cogenhoe in Northamptonshire where “in a 10 year period…1618 to 1628…two thirds of the population changed due to migration”. Don’t limit your thinking to the village where your ancestors were born and when you can’t find them there in subsequent years …give up…It would be like saying “people born on the other side of the country in Newfoundland would never move to Ft. McMurray Alberta for work”…they do now and they did then! Going backwards one generation, to search for William’s father has proved difficult. There are a number of William’s born in Warwickshire around this time and also one born in Lichfield, Staffordshire in 1600. Are any of these William’s the father I am seeking….who knows…..suffice to say….likely one could be and that makes my connection to Warwickshire even more certain. TIP: Spellings of names aren’t fixed..they change for many reasons….I look for Benford, Bentford, Beneford, Bendford, Benfford and Bennford and I am sure there are others….makes life interesting. ‘A pure native bird This: and tho’ his hue Be Coventry Blue Yet is he undone By the thread he has spun For since the wise town Has let the sports down Of May games and morris For which he right sorr’ is, Where their maids and their mates At Dancing and Wakes, Had their napkins and posies . . .’ Jonson ends by suggesting that the only use left for the Puritan’s thread is ‘to hang or choke him’. Sabbatarianism was also growing during this period. In 1588 the opening of shops, playing games, or idly walking about were forbidden during servicetime on Sundays. In 1599 these orders were intensified, indoor games and idly sitting in streets or fields being added to the other forbidden activities. Football in the streets would incur gaol after 1595 and children’s games in the street were forbidden in 1605. 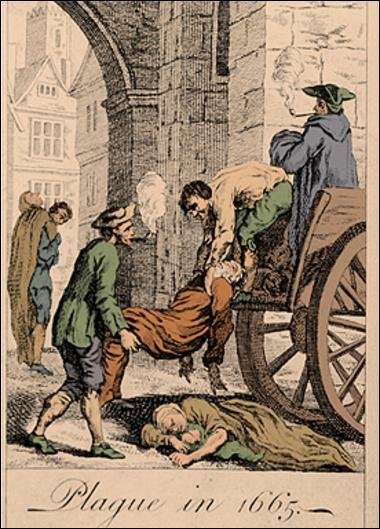 This suggests that the earlier prohibitions were being disregarded, as does the complaint of churchwardens that, in spite of their efforts, many ‘do lie in bed’, while others went to neighbouring villages where they could spend the Sabbath profanely, drinking and enjoying themselves ‘to the great dishonour of God and the offence of others’. In the same year church attendance on Sundays was made compulsory and listening to sermons and theological debates replaced the more frivolous recreations of the past. The first weekly lecture, which was to become a feature of the Commonwealth period, was established in 1609. The Puritans found that James I, like Elizabeth, disappointed their expectations. In 1611 they were ordered, in a letter from the king himself, to receive the sacrament kneeling, ‘to the grief of many’. Ten years later James refused to approve the new charter until he was satisfied that the orders of the church were being observed. The Puritans were back in the ascendancy in 1641 when the altar of Holy Trinity was replaced by the table. Two Presbyterians, Obadiah Grew and John Bryan, became vicars respectively of St. Michael in 1642 and Holy Trinity in 1644. The covenant was taken in 1643 and Coventry remained staunchly Parliamentarian throughout the Civil War period. It is possible that the phrase ‘sent to Coventry’ derived from the unbending attitude of the townsfolk to Royalist prisoners sent there. The diary of Robert Beake (mayor, 1655) gives some indication of the strict Sabbatarianism in force in Coventry during the Commonwealth period. Offenders were put in the stocks or the cage for travelling on Sunday, and even the man who was travelling ‘to be a godfather’ was fined. Most of Coventry’s chief citizens remained Protestant and anti-Royalist in sympathy, and many of the measures of the Puritan years, like the compulsory attendance at church and the closing of shops on Sunday, remained. Nevertheless, there was a conscious reaction against Puritan repression at the Restoration, at least on the part of those in power, and probably among many of the people as well. The Restoration was celebrated with feasting, bonfires, and conduits running wine. Grew and Bryan were ejected, the lectures suppressed, and maypoles brought back. In 1662 the font and organ were restored to St. Michael’s and the king’s brother, later James II, was entertained by the city council. The pageants were never revived but there was some attempt to recreate the pageantry and gaiety of an earlier period. Waits were appointed in 1674 ‘to play in the city as the waits formerly did, during the pleasure of the house’ and the Great Show Fair, the successor of the Corpus Christi Fair, was celebrated by feasting at about the same time. The year 1678 saw the permanent establishment of two institutions – the waits and the Godiva procession.